He or she showed up in your head sometime when you were young. Maybe you read a poem to the class and someone laughed at you, or you got new glasses that you thought were snazzy but the other kids teased you about. And this voice appeared to protect you, telling you to play it small—stay safe, don't stand out, don't take chances, don't put yourself out there—at every turn. When we become adults, this voice shows up even when we've outgrown those old messages and are fully competent and capable of playing big. - You see a job posting that calls out to you, and then your gremlin shows up to say: "No way, you're not ready. You're totally not qualified for that. Don't even apply." - There's an opportunity to step into a leadership role, but your gremlin says: "Who's going to listen to what you have to say? You're going to look stupid if you try for this." Of all of the topics and challenges that come up with my clients, this is the most universal. We all have this gremlin inside us, trying to hold us back. But there's no need to evict your gremlin or try to eradicate them from your thoughts. They've been your companion for a looong time, and after all, their intentions are sweet. There is a way to harness this voice and channel it for good. 1. Write down what your gremlin says to you. Carry a journal or create a note on your phone, and for one week take note of when the mean voice pops up. What are the specific messages your gremlin says to you? Are there certain situations that prompt them to show up? Each of us has messages of a different flavor, even though at their heart, they're all trying to tell you to play it safe. What themes come up for you? 2. Give your gremlin a name. 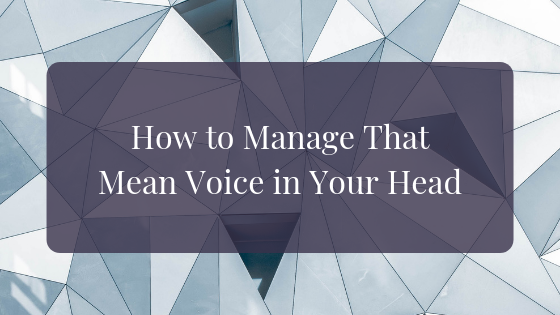 Separating the mean voice from your own voice creates some distance from these messages, and helps you realize that they are not you—they are just a misguided companion trying to keep you safe. I've met all kinds of gremlins through the clients I've worked with, with names like Max, Becky, Lousy Louise, The Creeper, Emma-Victoria, and the Three Witches (self-doubt, self-recrimination, and self-castigation)...the list goes on. Choose a name so that when that voice pops up, you can say: "Oh, hi Max. Thanks for showing up..."
3. Prepare your comebacks. Thank Max for showing up and for trying to protect you, then gently let him know that you're a grownup professional and you've got this. Remind him that you've applied for jobs before and that if you're not chosen you know it means that it wasn't a good match, not that you're a worthless person. Let him know that you appreciate his concern but you want to grow as a leader and you know that it's going to involve some failure...and you're both strong enough to experience that and welcome the opportunity to learn. 4. Give your gremlin a new job. Over the years, your gremlin has perfected their skills in spotting opportunities to play it small. One thing you can say for sure is that they're good at what they do! It may feel silly, but it can be incredibly powerful to have a conversation with your gremlin in which you change its job description. That can sound something like, "Becky, I so appreciate all you've done over the years to keep me safe. But now that I'm growing as a leader, I want to be more tuned in to stretching myself rather than playing it small. When those moments come up, I'd love for you to send me encouraging messages about how worthwhile this journey is and how everything I've done up to this point has prepared me for it." Cultivating and shifting your awareness around your gremlin can open up major opportunities to break through what's been holding you back and step into who you are meant to become.